Middlesex University and the Queen's Park Rangers Football Club (QPR) are working together to help prepare the team for the Premier League and enhance their performance. A team of Middlesex University strength and conditioning (S&C) coaches has been testing the physical and physiological fitness of the footballers in QPR's first, reserves and academy teams. During the month of July, the whole of the first team was tested before the start of the season. The QPR squad, which includes a number of high-profile former England internationals such as Joey Barton and Shaun Wright-Phillips, were put through their paces by a Middlesex team consisting of lead strength and conditioning coach Anthony Turner, Lygeri Dimitriou and Shyam Chavda. Their testing includes measures of aerobic physical fitness, endurance, lower body power, reactive strength and scanning for muscle and body fat composition. "It's been a great opportunity to work with QPR," Anthony said. "The players are obviously well prepped by their sport science and medicine team as they came back from the break in good shape and gave the fitness assessment their all. 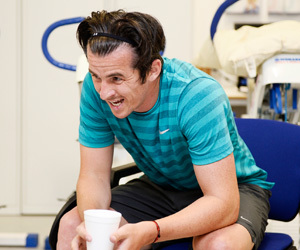 They have some great athletes and I'm sure that will see them perform well in the Premier League this season." Strength and conditioning training is targeted at athletes and is increasingly seen as essential to all professional football teams. Through its partnership with Middlesex University, the QPR squad has access to the sophisticated equipment housed within the University's advanced sports facilities at Allianz Park, North London – also home to Saracens Rugby Club. 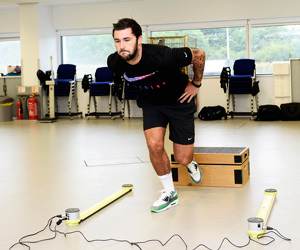 As QPR enters the Premier League this season, the S&C team – led by QPR's Head of Fitness, Carl Serrant – has helped the squad to identify each athlete's fitness level, enabling training to focus on making them faster, stronger and fitter so they perform better and remain injury-free. "Working with the expert coaches at Middlesex University has been an invaluable experience for us, and one which has been fully embraced by all the players," Carl said. "We were able to collect a lot of detailed information about the squad, which has allowed us to individualise pre-season training accordingly and prepare well for the demands of the Premier League. I would like to say a big thank you to Anthony, Lygeri and Shyam for the thoroughly professional manner by which they conducted the testing and I look forward to our ongoing relationship with the university." Middlesex's S&C experts are also working with other elite sports teams, including the British Fencing World Class Programme where they are looking after the athletic development of current and future GB fencers as they prepare for Rio 2016. Take a look at all the action from QPR's strength and conditioning with Middlesex below. Middlesex's S&C experts are also working with other elite sports team, including the British Fencing World Class Programme where they are looking after the athletic development of current and future GB fencers as they prepare for Rio 2016.Take a look at all the action from QPR's strength and conditioning below.